Your pictures make me at the same time tearful, and warm and fuzzy inside! 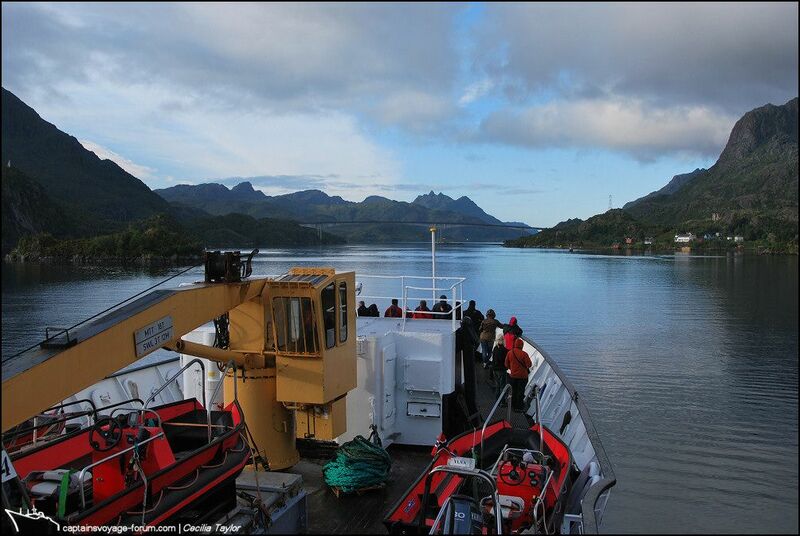 Happy, because through your pictures you show the ship so alive, and so "meaningful" in her natural environment. And sad, well... you guess why. All your pictures are stunning but I like this "sunset and cloud over the lifeboat", also the wide angle pictures, unusual, and also your #1460 (even though it's not from the ship directly) which is really great and almost fun! Thank you very much for sharing this journey with us. 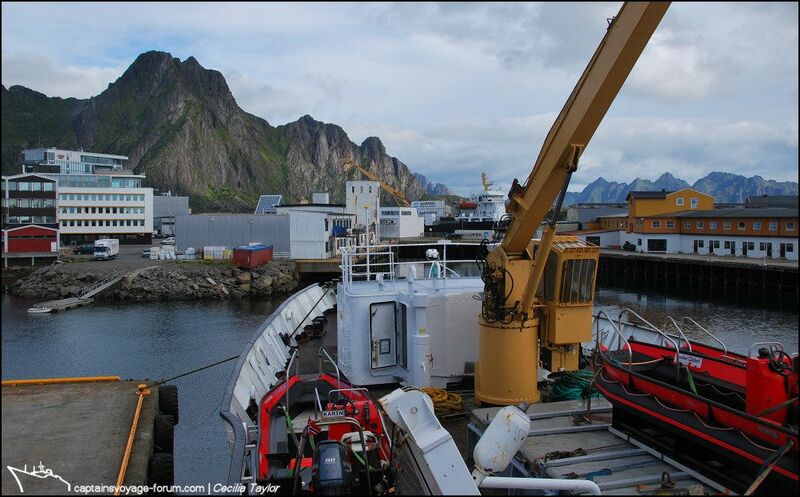 To see your images from Svalbard was very exotic to me. And VERY exciting. Since your voyage-report now has come to waters I am more familiar with, I feel more at home. And, as "Sarnia" here, I have a bit ambivalent feelings. 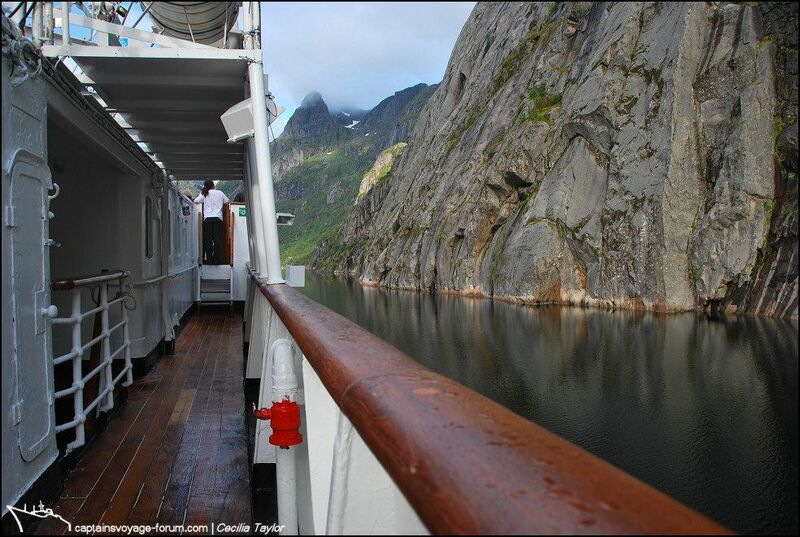 Fantastic photos of fantastic nature and a fantastic ship. 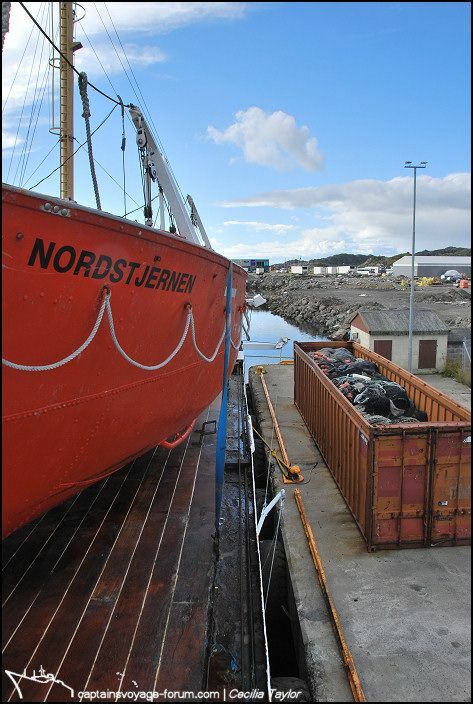 But also a little sad feeling that this fantastic ship "Nordstjernen" is no longer available to me as a hurtigrute. But I loove that you, of all people, gives me those feelings. And as you probably already have figured out, your image in post "1459" is my favourite. I see a lot of "ME" in that wonderful mood-image. And thank you for posting those images of our friend "articGateway" in action. It is so nice to see CVF-friends meeting in person. And it is also a pleasure to see the persons behind the nick-names here on CVF. Thanks again. And the best of all.......We still have a lot of images to look forward to, further south. Last edited by HurtigruteMartin; September 28th, 2012, 16:23.
great images and a very nice skyscape,Cecelia. So fun to see RW and NX together. And your pictures are amazing as usual. It's nice to follow this journey. I haven't visited this thread for a purpose: because I want to spend time on it when you have done all your images... I want to use this thread as an evening entertainment thingy whilst spending time in the local hospital. Time will be so much more interesting when I have this long thread to look at. I have also finished (FINALLY) editing all my March images taken on the Nordstjernen... when you are done, I will either add them to this thread or make a separate thread for them (not sure how to do it yet). And dear Jan-Olav – the effort I’ve put into this thread these last weeks now means even more to me, knowing that it might make those evenings more pleasurable for you. Naturally I am very much looking forward to seeing your photos from last March, so what better incentive to press on with the present voyage! 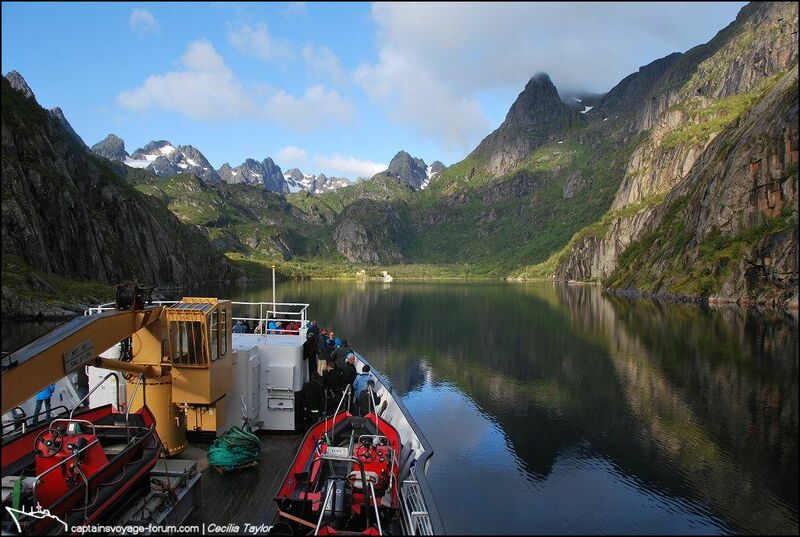 All aboard for the Trollfjord everyone! Sortland before breakfast! 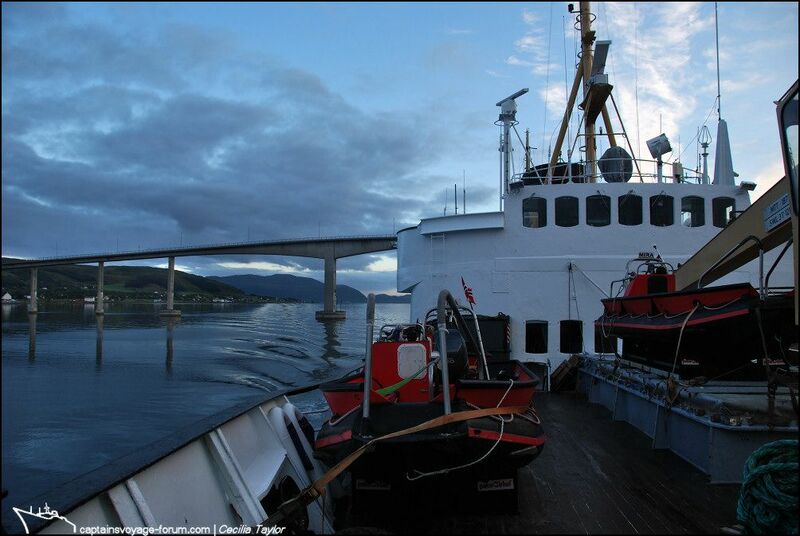 I was out on the foredeck so as to include more of Nordstjernen in the photo frame as she passed under the bridge. That strange feeling again, the time of day, the ship scampering by without stopping. Last edited by Seagull; October 2nd, 2012, 09:20. Raftsundet, eight in the morning. An hour later and practically everyone has breakfasted and is out somewhere on the decks. 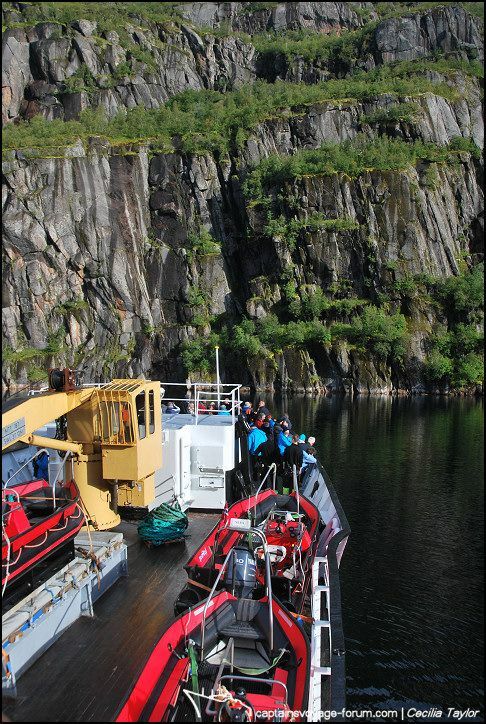 We are going into the Trollfjord. I can’t keep still in one place for long, like pakarang’s “speed-sightseeing” in miniature. 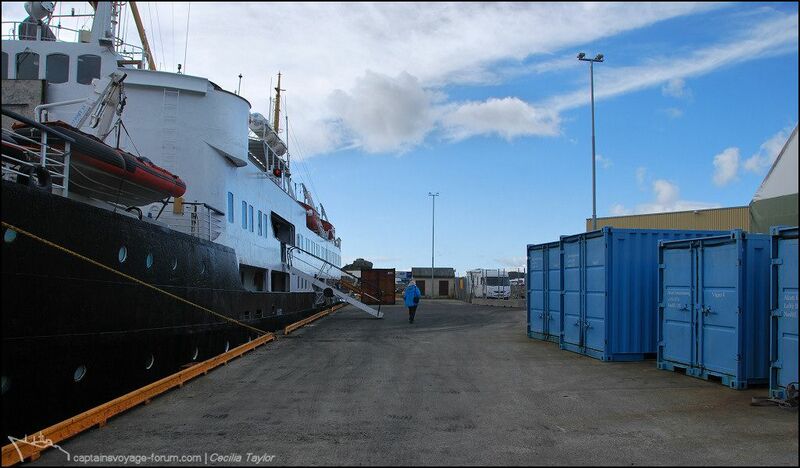 I want to capture many parts of the ship in my images, here, in this so photographed and recognisable a place. 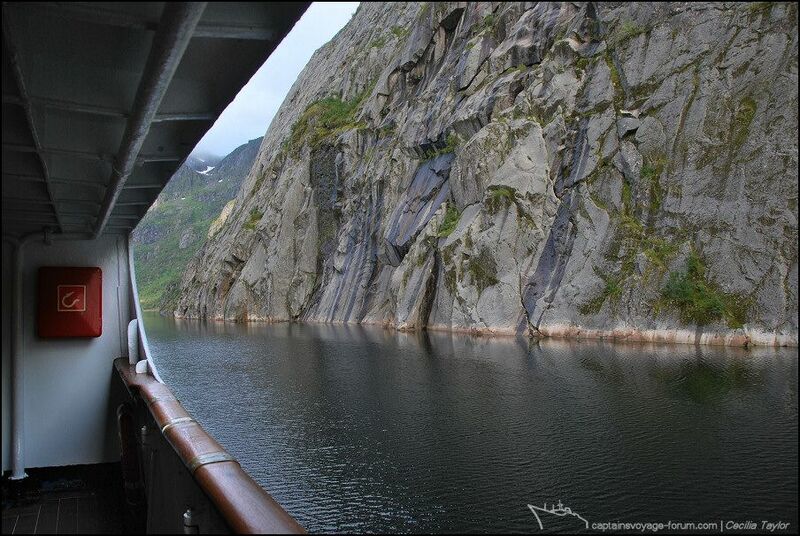 …and up on the bridge wing, as the ship approaches the head of the fjord and the sunshine comes out. Turning around on the spot…and did we do it just one more time or even twice? …Everyone is fore or aft it seems. 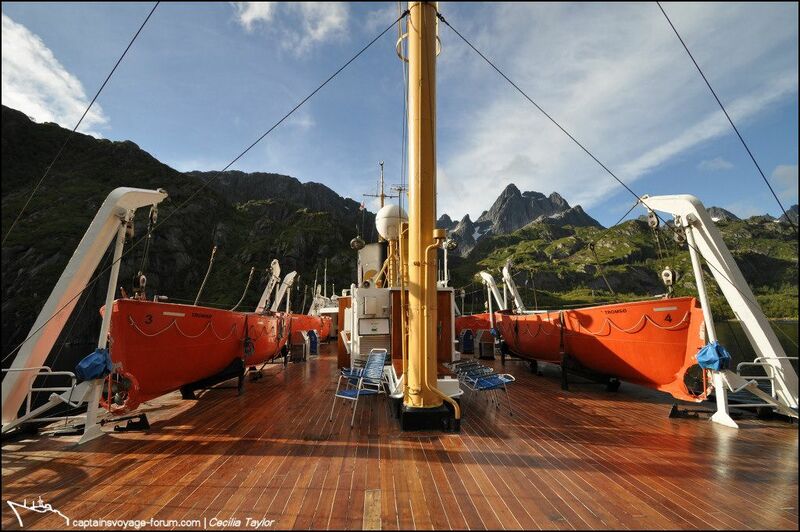 I have the boat deck to myself as the mountains revolve magically around me. There is one last photo which must be shown, if you will indulge me. 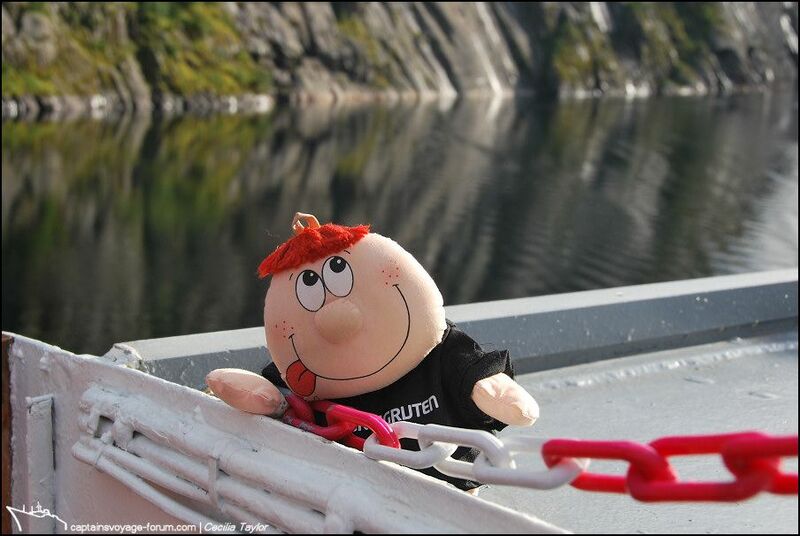 Well, my travel-mascot IS a troll, albeit of the small, fresh-complexioned, shorter nosed and tail-less species –so if there is anywhere he must be photographed it is surely here in Trollfjord! 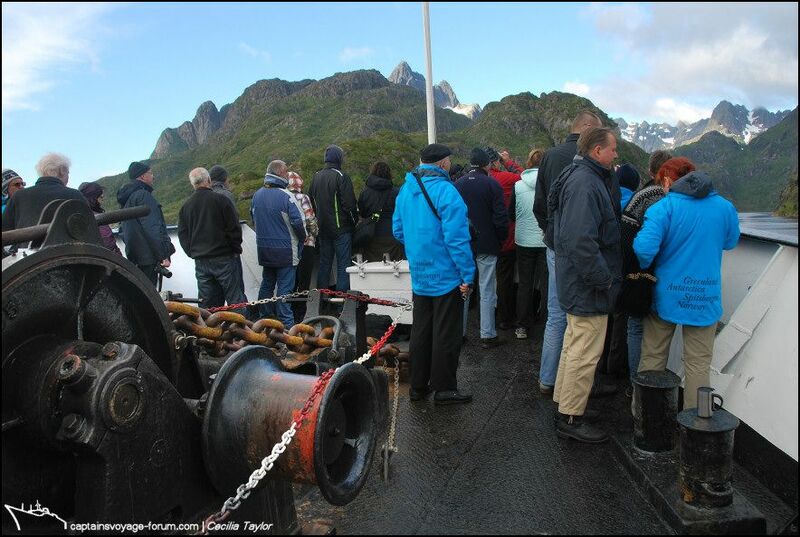 A subsequently relaxing morning of passing scenery was followed by a surge of activity in Svolvær. 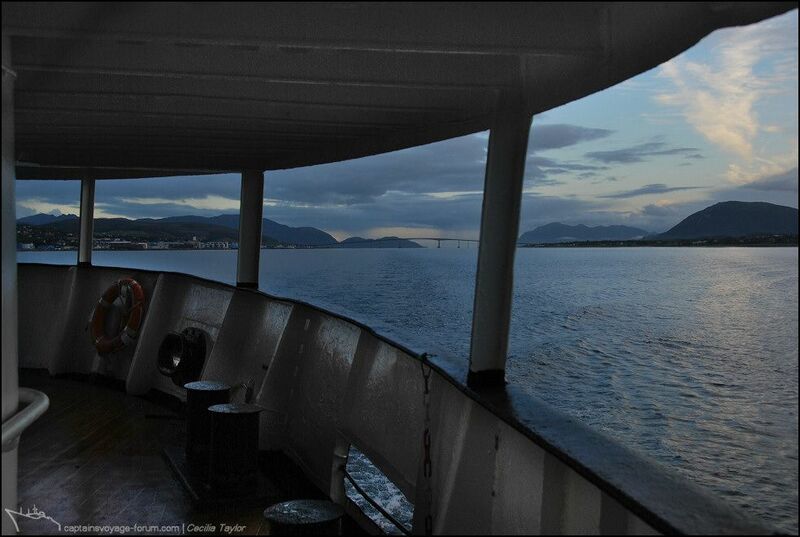 I like the blue colours in this one, and the blue reflections in the ship's windows. 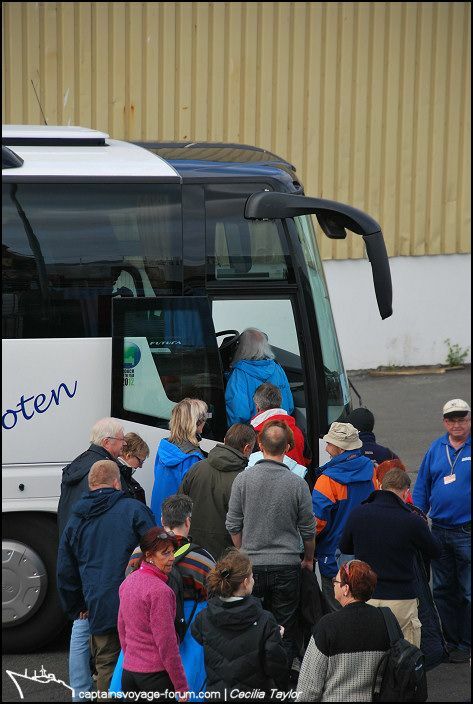 I think I was as relieved as the tour guide was when the bus finally arrived at the quayside, and the earlier excursionists set off. I return to the serious business of photographing the ship-at-Svolvær, for we are not, of course, moored in the usual hurtigruten place.